I did added a lot of Hebrew translations to PrestaShop for my client’s shop Hibuki, that should be released soon. And also helped to a community. It’s important to share translations and to make it better. Prestashop RTL version is still very basic. In fact, its RTL CSS code has only one or two lines. But I fully customized its CSS myself to make it real RTL and suitable for a Hebrew web store. Now I could produce Hebrew RTL web shops with ease. Here’s the Prestashop blog’s article featuring myself among top 10 contributors to Prestashop translations. 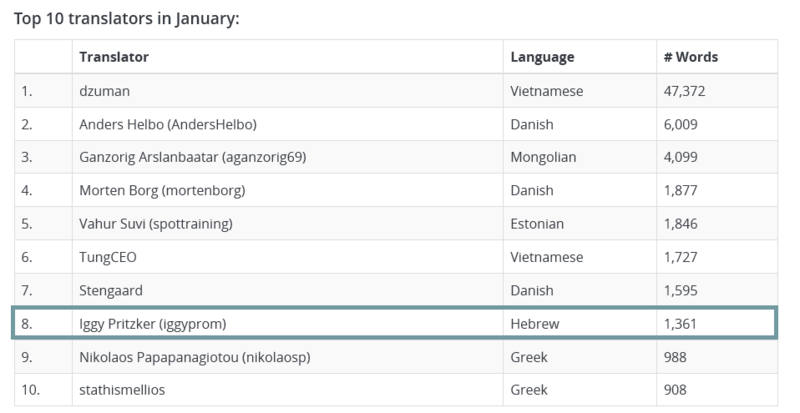 Last months I’ve made even more Hebrew WordPress plugins translations, than what was done for Prestashop. Mostly BuddyPress and Events Manager plugins, but also some smaller plugins projects. I prefer to make it for community, with a hope that somebody would also improve it, and more sites with RTL support would go online. The development of WordPress must include a better RTL-support too. So I call all developers to share their translations thru respective translations projects. If you making a translation for your own project, first contribute missing terms and phrases to community based open-source translation services, like Crowdin for Prestashop or GlotPress for WordPress. Later you’ll be able to download it for your own use and to polish it with Poedit translations editor for your own use, if changes are needed. But together we could build a better Hebrew support for future projects. And translations will automatically download next time you start a new CMS project or download a plugin from a repository. Iggy, it’s a pleasure to work with you, thanks for great service and fast work.